Broccoli stems. Isn’t it funny that we spent so many years throwing this yummy part of the broccoli in the rubbish? We were so ignorant of the goodness that we were wasting. 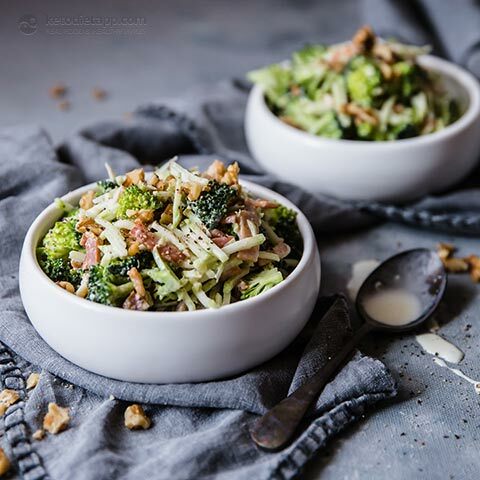 I love broccoli stems, I don’t think that they taste anything like the broccoli florets, they have a kind of fresh yet nutty flavour that is close to kohlrabi. Anyway, this salad is fresh and crispy and the perfect way to use up those leftover stems. 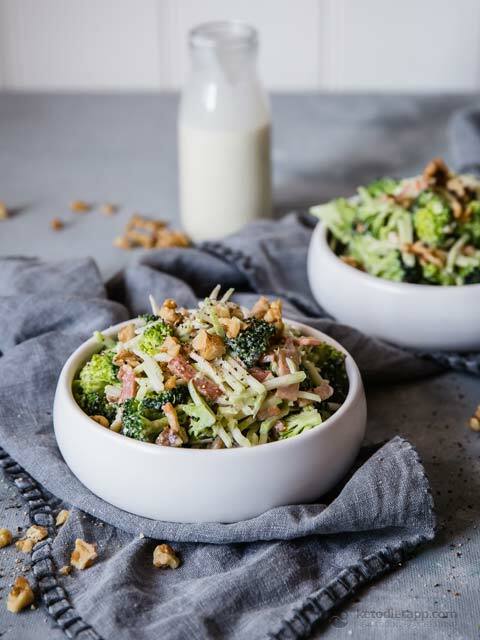 The buttermilk dressing is creamy yet neutral, so if you want to add some fresh herbs to yours you can. 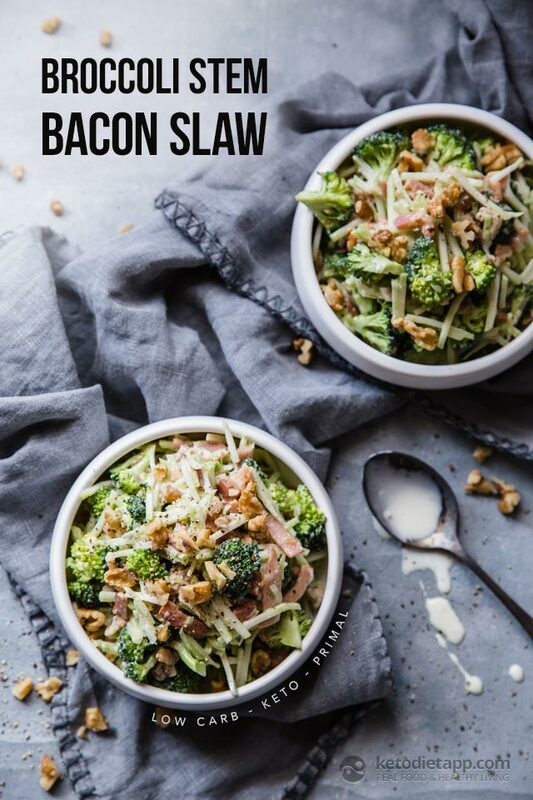 I prefer mine this way so that the flavours of the salad shine through. Enjoy! Note: You can use sour cream instead of full-fat buttermilk (the effect on the carb count per serving will be insignificant). Prepare all the ingredients. 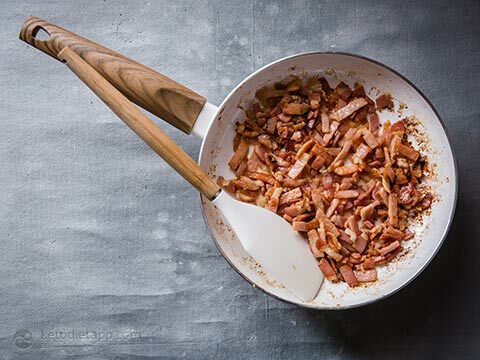 Chop bacon into strips. Fry over a medium high heat. Finely chop the garlic and add it to the bacon while cooking. Meanwhile, peel the broccoli stems and cut them finely. 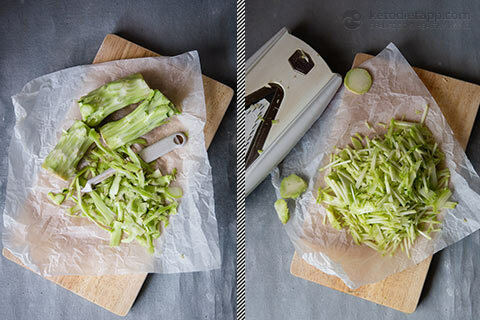 I used the julienne setting on my mandolin, but you could slice them very thinly or julienne them yourself if you have better knife skills than me. 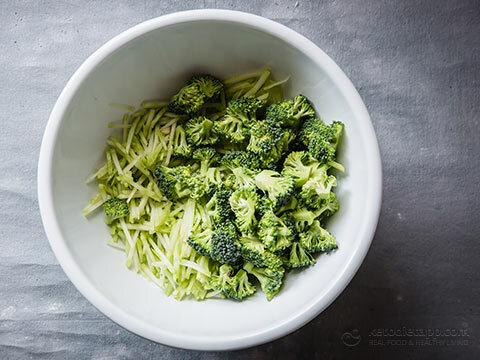 Cut the florets into very small pieces and place in a large bowl with the broccoli stems. 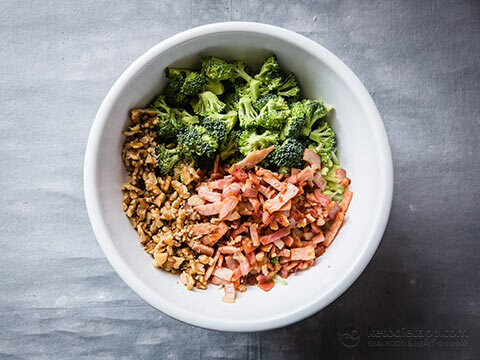 Note: If you don&apos;t like raw broccoli florets, lightly steam or boil the florets for 2-3 minutes. When cooked, place in ice water and drain. Add the bacon while still warm, including bacon fats. Add roughly chopped walnuts, reserving a small handful to garnish. Toss all of the salad ingredients together and then leave to sit while you make dressing. 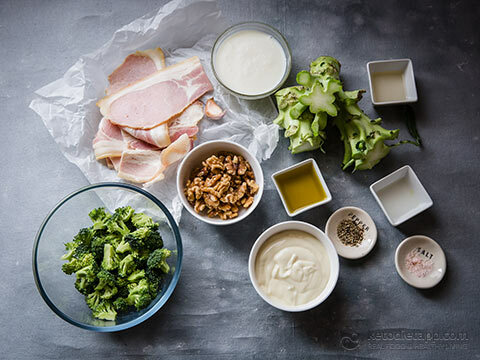 Place all of the buttermilk dressing ingredients into a small mixing bowl. Whisk together until well combined and pour into a serving bottle. Pour over the salad and toss to combine. 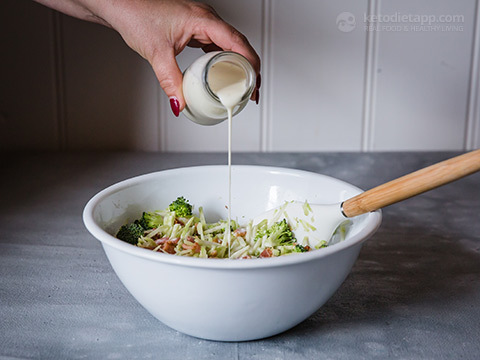 Note that this makes enough dressing for a couple of salads, so don’t pour all of it on to this one salad. Store salad, covered, in refrigerator for up to three days. 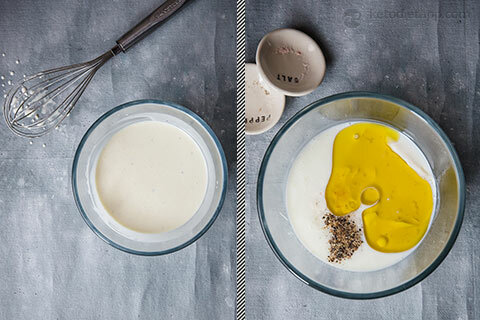 Store buttermilk dressing in jar in the refrigerator for up to five days.